The Aoyool Wifi repeater expands yours existing WLAN also expands wireless networks into hard-to-reach areas with 802.11 ac technology. you can connect to the two Ethernet and any device such as Smart TV, Multimedia Player, Game Console or PC to your WiFi network. The 4 x 3dBi external antennas extend your WLAN to every corner of your home. With one touch of a button on the WPS button of the Aoyool wireless amplifier and your router, you can easily extend your WLAN range. (if your router does not have a WPS button).The smart LED signal display provides a simple and clear display, helping to find the best place. Wireless Access Point- Covert a wired network to a wireless network. Wireless Router- Create an instant private wireless ac network. 【Compatible with WPS Model】, Aoyool WLAN Repeater supports the Quick Security Setup, which requires users to simply press the "WPS" button on the outside of the device to instantly establish a highly secure connection. This is not only faster than normal security setups, but also more convenient that avoid remembering a complicated password. 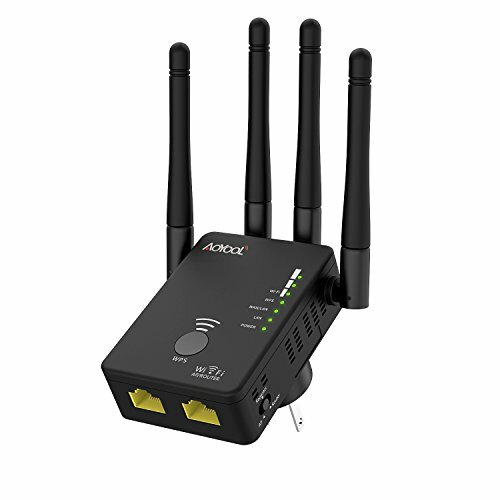 【High Performance】Four external antennas provides up to 1200Mbps transmission rates;Aoyool WiFi extender is dedicated to boost the range of existing WiFi,resolve the problem with a weak signal in a good method and create a stronger signal in dead areas.Covering your bedroom, floors, restroom, garage, basement and garden. 【Strong Compatibility】: enhancing the existing Wi-Fi coverage, the Ethernet ports can connect any wired device, such as a smart TV, a media player, a gaming console, or a PC, to the network. Compatible with any existing standard Wi-Fi router, you will have access to the necessary connections for the iPad. 【Low Radiation】: built-in energy-saving environmental protection system, save electricity and environmental protection, free frequency conversion settings, effectively reduce radiation area, safe and sound, radiation only for mobile phone one third. If you have any questions about this product by Aoyool, contact us by completing and submitting the form below. If you are looking for a specif part number, please include it with your message.